The BBJ is the VIP configured variant of the very successful Boeing 737 series of aircraft. Passenger configuration varies from 16 – 48 seats. The BBJ is luxuriously appointed with all the latest cabin facilities on board offering first class catering. 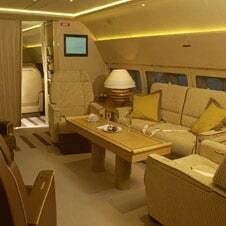 Depending on the configuration some aircraft are offered with a state room and other private rooms. Luggage capacity is very generous and the range of this aircraft varies between 8 – 10 hours or 4000 – 5400 miles.